Do you know how to do SD card data recovery when you delete files by mistake or SD card gets corrupted? SD card recovery can be achieved successfully by SD card recovery software as long as lost files are not overwritten. In this article, you can find methods to recover lost or deleted files, photos, emails, video, documents from SD card or corrupted memory card easily and effectively. Now, let's take a close look at the process. DiskGenius - Reliable SD card recovery tool that gives full chance of recovering lost files from SD card. SD card is a kind of memory card and it is thin and light storage device. Its particular form features turn it to be ideal storage media for many digital products such as camcorders, GoPro, digital camera, Android smartphone, tablets, music players, surveillance cameras and other devices. You can easily put a memory card into your camera or mobile phone, and then take lots of photos or videos to fill it up. Then take it out of device and connect it to computer so as to transfer data to PC and backup. If you crack open a SD card, you'll see it is quite similar to the inside of a USB flash drive. It contains one or more memory chips and a controller on the circuit board. Memory chips work to store all your data and controller is responsible for keeping track of bad blocks, regulating data, etc. In this digital era, the utility of data keeps growing and we need to processing and storing large amount of data every day. Many of us count on extended capacity from external storage such as external hard drive, USB flash drive, memory card, etc. SD card can be used to store various files like photos, documents, messages, music, video clips, etc. It brings great convenience as well as troubles. For instance, you may lose data on SD card because of accidental deletion, formatting, SD card corruption, virus attack, bad sector and so on. It'll be heartbreaking if files get lost permanently. Although we are always suggested to back up data in regular so that we can restore data easily once something goes wrong or valuable data gets lost, few of us are willing to take time to back up files. Sometimes, even though we follow the advice and backup data, there is possibility that not all files get properly backed up. For example, an important path may not be included in the backup, or the backup disk gets damaged. Hence, data loss issue is not avoidable for SD card and other storage devices. Since we cannot escape data loss issue, we need to learn how to recover lost files from SD card. SD card data recovery is a necessity to save the day and it is helpful skill to both beginner and professional users. Next we'll talk about causes behind SD card data loss issue and how to quickly fix it. Deletion: Accidentally deleting files on SD card is one of the major causes of data loss issue. Users may press delete button by mistake and get important deleted. Formatting: Mistakenly formatting an SD card removes all data on the device. Fortunately, most times quick formatting is performed by default and recovery of lost data is possible. SD card corruption: SD card turns to RAW, and it is not accessible. You may receive error message like "Disk is write-protected" "Disk in drive is not formatted. Do you want to format it now?" Virus and malware: If SD card infect virus or malware, files on the memory card might be damaged or deleted. Bad sectors: Bad sectors are areas that cannot be read or written normally. If a disk or memory card contains bad sectors, files may get lost. Power surge: Memory card can fail to work due to power surge. When SD card is connected to a device and power surge occurs, the PCB in the memory card can be shorted out. The result is losing all data. Physical damage: SD card not showing up or not recognized by Windows indicates it is physically damaged. Lifespan: Memory card, USB drive, hard drive and other storage devices have a limited lifespan, and they are bound to stop working after a certain period of usage. Quality issue: If your SD card is not bought from legitimate platform, you are likely to get a fake card which might not be qualified as advertised. Eassos Recovery Free is free hard drive and memory card recovery software. It provides four recovery modes which is capable of recovering deleted files, recovering formatted/RAW drive, restoring lost partition, etc. The entire recovery process is guided by a user-friendly wizard, which caters bother newbies and experienced users. This free edition includes all features of its corresponding paid edition except that it can recover 1GB of data. If the amount of your lost data is more than 1GB, you can upgrade to the full edition which recovers an unlimited amount of data. DiskGenius is professional data recovery software for all kinds of storage devices. It offers both basic and advanced data recovery options. As to SD card recovery, you can execute file recovery and partition recovery, which enables you to restore deleted files, lost files from RAW drive, recover lost partition, etc. Besides, it can perform deep scanning and search for files by file types. 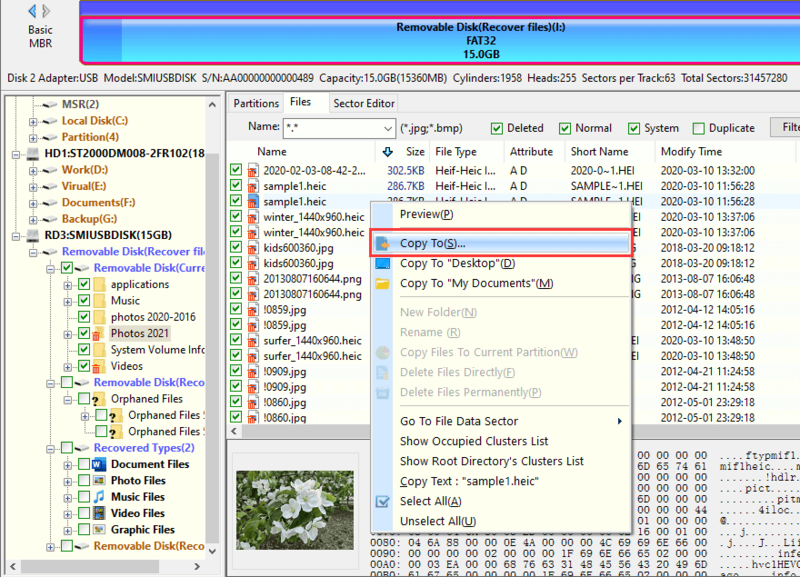 If you are experienced user, you can also try analyzing or editing hex data on SD card to locate recoverable data. With this application, you can perform hard drive recovery, partition recovery, file recovery, SD card recovery, SanDisk data recovery, external hard drive recovery, virtual disk recovery, etc. It supports various file system types, including FAT32, NTFS, exFAT, EXT2, EXT3 and EXT4. This is a step-by-step guide for recovering deleted, lost or formatted files from SD card, USB flash drive, hard drive, external HDD, pen stick, etc. The recovery process is done under Windows 10 with the help of DiskGenius. Connect your SD card to computer and follow the guide to retrieve lost data. Step 1 Download, install and launch DiskGenius on your computer. Then you can view the SD card is listed in the main interface. Select it and you can view detailed parameters. Step 2 Right-click on the SD card and choose Recover Lost Files from context menu. You need to select the correct device from the disk list, otherwise, the software won't be able to search for correct data. Actually, it is quite easy to identify SD card from disk list, as you can view capacity, drive letter, file system format, etc. to easily locate it. Step 3 Select Recover Deleted Files and click Start button to search for lost data. "Recover Deleted Files" is designed to look for deleted files, and you need to select "Complete Recovery" if you want to retrieve file lost due to other causes. Besides, "Search for Known File Types" is deep scanning option, which should be selected in order to find out as many files as possible. Step 4 Preview recoverable in scanning result. DiskGenius gives options of previewing all files listed in scanning result. You can double-click a file to open it and view file content in original size. It supports to preview pictures, videos, audio, text, PDF, MS office files, etc. If you cannot see needed files under directory part, then view files listed under "Recovered Types". Step 5 Recover files you need. Select files and folders you want to recover, right-click on selected data and choose "Copy To" option. Then you can specify a location on your computer to save recovered data. SD card corruption is another common data loss situation. An SD card can get corrupted due to reasons like device quality issue, improper usage, limited lifespan, etc. Here are some symptoms of corrupted SD card. Files stored on the SD card disappears suddenly for no reason. Cannot add, delete, copy or save any data on SD card. When you try to format SD card, Windows was unable to complete the format. Get "The disk is write-protected" error message even though you didn't set it read-only. Cannot open it in File Explorer and receive error messages like "Drive is not formatted. Do you want to format it now?" "Drive is not accessible. The file or directory is corrupted and unreadable"
SD card is full of bad sectors if you run a bad sector scanning. SD card not showing up in computer. If SD card is just logically corrupted, you can follow the guide to perform corrupted SD card recovery and retrieve lost data. When files are restored successfully, you can try formatting the memory card to get it repaired. Step 1 Connect the corrupted SD card to computer and launch DiskGenius. Then check if the SD card can be recognized by the software. 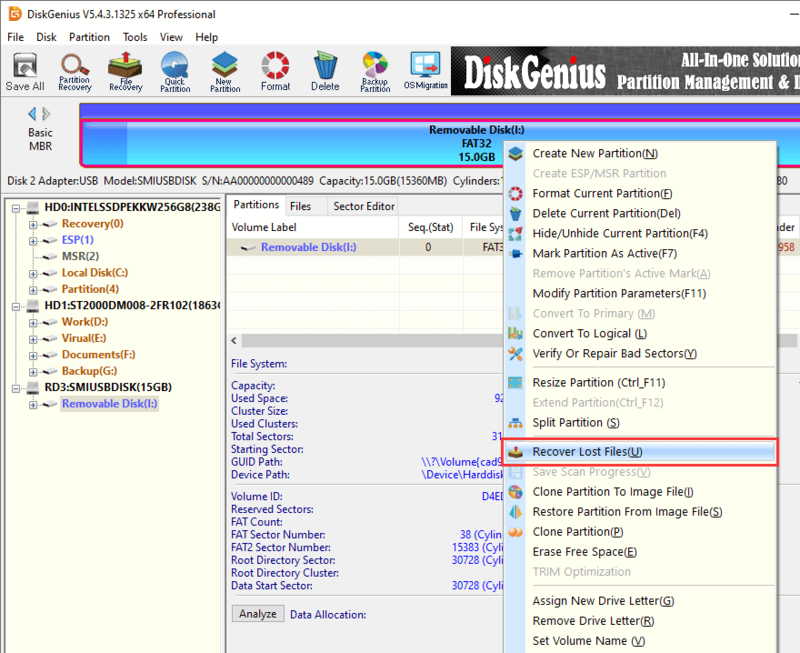 As long as the device can be recognized by DiskGenius, you can try RAW partition recovery. Many times, the corrupted SD card may be shown as unformatted or damaged. Step 2 Select the SD card and click File Recovery button from toolbar to open Recover Files window, as follows. Then select "Complete Recovery" and "Search For Known File Type" and click Start button to search for lost data. Step 3 Preview and recover data from corrupted SD card. File preview helps find out data to be recovered precisely and make sure whether files are damaged. Choose what you want to recover and save them to computer. All in all, SD card recovery and corrupted memory card recovery can be done by proper recovery software. Remember to protect lost data against data overwrite before all files are recovered. DiskGenius has covered all features you may need to deal with all kinds of data loss issue on SD card, USB flash drive, hard drive, etc. If you need to recover files from memory card, then download DiskGenius and restore lost files. Should you have any questions regarding using data recovery software, please feel free to contact us. 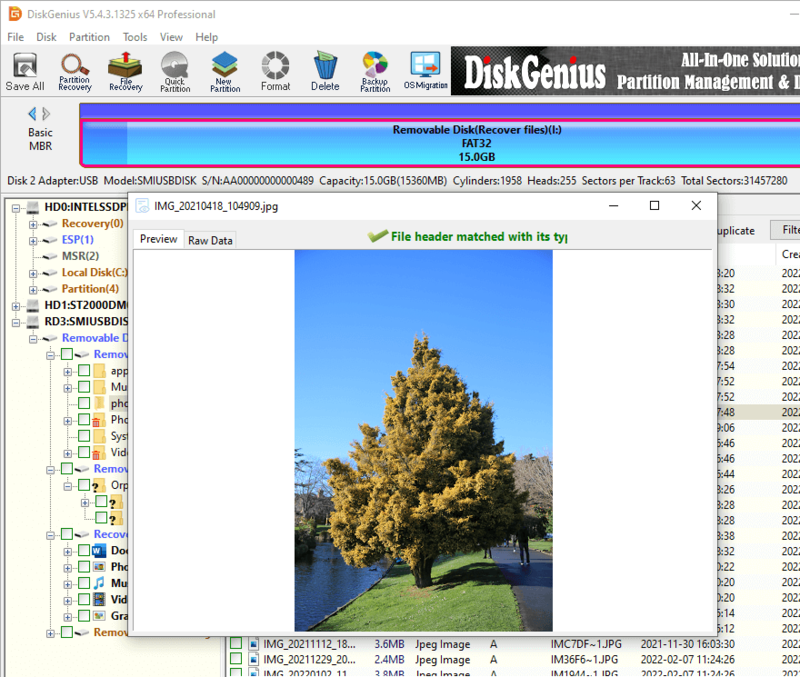 DiskGenius - Helps recover all types of data from SD card, hard drive, USB flash drive, pen drive, virtual disk, etc.